Antibiotics are a brilliant thing, they revolutionized medicine, and raised life expectancy. However, the way they are used these days is a pet peeve of mine. They are over-prescribed, often for things they will do nothing for. They are put into the food of the animals we eat in frightening quantities, since the conditions they live under make them sick. Courses aren’t finished, or are never started, and they join the amazing amount of medication flushed down toilets or thrown away. There are so many negative repercussions, including the fact that some of the worst of the bugs are becoming resistant to most of our antiobiotics. One of my goals has been to create options for most of the ‘standard’ illnesses, in order for my family (and others) to have things to reach for when sick. There are circumstances under which a doctor’s visit and a prescription are advisable, but if I can knock it out with a tea or two instead, I prefer to. AnTeaInfection is our general “Something is making me sick” tea. It is anti-bacterial, anti-viral, and anti-fungal. It can be taken as a tea with sweetener, it makes a decent start to a broth for rice, and it can be used as an external wash.
* This tea should not be used while pregnant or nursing. 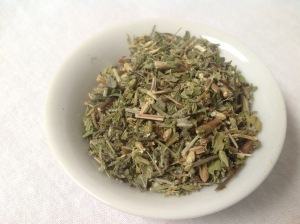 This entry was posted in Medicinal Teas and tagged Anti-Bacterial, Anti-Fungal, Anti-Viral, Organic Chickweed, Organic Herbal Tea, Organic Medicinal Tea, Organic Sage, Organic Tea, Organic Yarrow, Tea for Infection by DesertSage. Bookmark the permalink. I’m counting on this to solve an on-going problem. It tastes good and seems to have solved another infection I had, in a hurry. 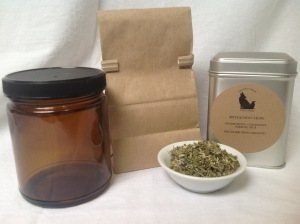 This is great stuff – not only does it smell and taste wonderful, it really helps nip infections and viruses in the bud.